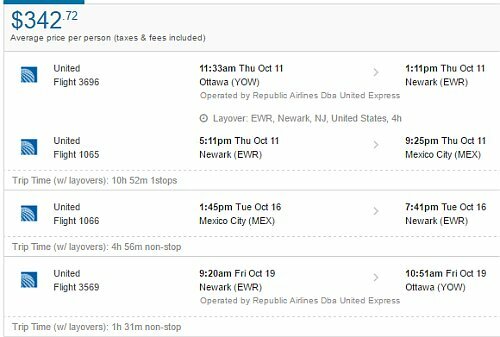 United Airlines is showing 2-in-1 flights that allow you to spend time in both Mexico City and New York City for a total price of $342 CAD roundtrip including taxes. This is over 50% cheaper than if you were to buy a separate roundtrip ticket to each city. From Ottawa, flights to Mexico City alone usually run a minimum of $550 roundtrip. You can also play around with the middle date to give yourself more or less time in Mexico City versus New York City. ottawa, yow, flight deals, united states, mexico, new york city, new york, united airlines, newark, ewr, north america, mexico city and mex.